Belgian Congo was a free state founded by King Leopold II that was annexed to Belgium as a colony in 1908. Between 1884 and 1908 it was the Congo Free State privately controlled by Leopold II. 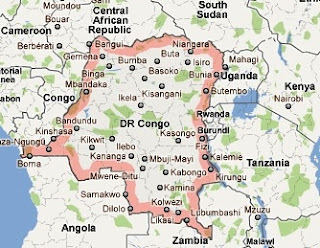 Belgian Congo gained independence and became the Democratic Republic of Congo (DRC) on June 30, 1960. The first stamps of Belgian Congo were Independent State issues depicting a head-portrait of King Leopald II in different colors and denominations. The set (Scott #1 to #5) of five stamps catalogs for around $400 Mint and around $300 Used. There are certain varieties of the highest denomination which catalog much higher. This was followed between 1887 and 1894 by another set of Leopald II issues. That set (Scott #6 to #13) is more expensive and catalogs in the $1.5K range for Mint and around half that for Used. The first original issues were a local scenes set of thirteen stamps (Scott #14 to #26) issued between 1894 and 1901. The set catalogs for around $375 Mint and around $95 Used. The designs show Port Matadi, River scene on the Congo and Stanley Falls, Inkissi Falls, railroad bridge on M’pozo river, Hunting Elephants, and Bangala Chief and Wife. Several other local scenes sets and certain varieties were the primary stamp issues of Belgium through the period till 1928. Belgian Congo released a large set of fifteen stamps on June 30, 1928 depicting a portrait of Sir Henry Morton Stanley in different single-colors and denominations. The set (Scott #115 to #129) is sought after and catalogs for around $20 Mint and around half that for Used. A set of seven stamps depicting the four kings (Leopold I, Leopold II, Albert I, and Leopold III) was issued on August 15, 1935 and that set (Scott #159 to #165) catalogs for around $10 MNH and around half that for Used. The most sought after set among the later issues is a large set of twenty six stamps issued between 1947 and 1950 in the “Carved Figures and Masks of Baluba Tribe” theme. The set (Scott #231 to #256) catalogs for around $45MNH and around $5 for Used. The designs show “Ndoha” figure of tribal king, “Tshimanyi” idol, “Buangakokoma” – kneeling beggar statue, “Mbuta” – sacred double-cup carved with two faces (man and woman), “Ngadimuashi” – female mask, “Buadi-Muadi” – square mask, “Mbowa” – buffalo horned executioner’s mask. The first coins of Belgian Congo was a 5 Centimes Copper-Nickel coin issued in 1909 with a mintage of 1.8M. The issue (KM# 12) shows a crowned “JL” with a hole in the middle in Obverse and star, date, and value in Reverse. It catalogs in the $200 range for BU and can be had for as low as $5 for F. Copper-Nickel varieties with denominations up to a Franc formed the major coin issues of Belgian Congo. Higher denominations using distinct designs include a hexagon shaped brass 2 Franc coin issued in 1943 with a mintage of 25M. the issue (KM# 25) catalogs for around $75 in BU. The design shows the denomination with stars flanking in obverse and an African Elephant with date in Reverse. Other higher denominations of prominence include a 50 Francs silver coin (KM# 27) issued in 1944 with a mintage of 1M. That coin catalogs in the $200 range in UNC. It has a similar design and contains 0.23914 oz actual silver weight. Belgian Congo was administered together with Ruanda-Urundi between 1925 and 1960. As such coins of both these areas were made jointly during the period between 1952 and 1960. Ruanda-Urundi Aluminum and Brass Centimes of the period are pretty common and catalog in the few dollars range. There are silver Essais (E1 through E6) of the 5 Franc denomination for a few different years and they catalog much higher. Colonial era postcards, Christian missionary maps, and authentic Congo fetish figures, sculptures, etc form the major collectible items of the area.